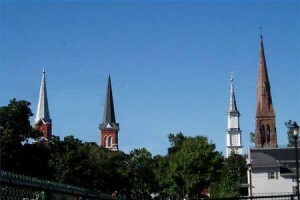 What you are looking at in this picture is just Church steeples, right? WRONG! While the Church considers them a staple in architecture, they are deeply rooted from the Pagan worship of the sun god Ra. They are found on just about every continent in the world and were around long before the Church started using them. These are officially called Obelisks. They were constructed as a sort of memorial or statement by the Pagans in their worship of Ra. It is representative of fertility as it resembles the male reproductive organ which is forever “fertile”. Ask yourself this: Why would any Church knowingly construct an Obelisk knowing God commanded us not to??? If you were to ask your local Church, “would you be okay with creating a building with a symbol of Ra/Baal as it’s focal point” and they would immediately say no. We believe we are so far removed from the days of Ra/Baal worship that we overlook how it was used. We are warned by God from the beginning to beware of doing things or worshipping HIM in the way the Pagans worshipped their Gods as stated in Deuteronomy, this includes constructing Pagan Obelisks. So now you have learned the meaning behind a Church steeple. Here is an example of what God thought about these Obelisks..
2 Kings 17:9-11 And the people of Israel did secretly against the Lord their God things that were not right. They built for themselves high places in all their towns, from watchtower to fortified city. 10 They set up for themselves pillars and Asherim (Obelisks) on every high hill and under every green tree, 11 and there they made offerings on all the high places, as the nations did whom the Lord carried away before them. Now, we do not believe this is some sort of conspiracy by the Church to get us to do things associated with another god but we do believe this “adopted” practice of building these on Churches is one way the adversary is turning us away from God. He has sort of infiltrated the belief system about these symbols and made them acceptable to us as something that all Churches should have. The Vatican even has one of these. The Washington Monument is also one of these. Here is a creepy thought. The base of the Washington Monument on each side is 660 inches or 55.5 feet and the height of the monument is 6660 inches tall or 555.5 feet. This is not a coincidence. This is the adversary hard at work in modern times trying to trip us up sort of speak. We, as Christians, must turn away from these things. It isn’t about what it means to us inside. It is about what those symbols mean to HIM. They are detestable to HIM. This info really bless my studying of church steeples. During 1868 Calvinists sought a way to delay Revelation. American imperialism toward latin America had reached its peak. Nova detailed how church steeples have a constant height of 144 cubit feet. 1868 + 144 = 2012…. The meek and faithful practiced adoration of sun and environment then eventually practiced Catholicism. Mayans and current global record temps speak for themselves. I have known this for a long time but have never really known what to do about it. My personality is to “fix” what is broken and things like this are very frustrating. I am reminded of Luther and his 95 thesis that he nailed to the door of the church because he wanted the world to know that the established religious system was wrong. As light holders, are we not to do the same thing? Why don’t we go to the pastors of these churches and ask them how they could lead a group of people with such a blasphemous image attached to the roof? No wonder the Holy Spirit is not in these places because God is offended. The truth should open our eyes and set us free and the pastors that discover this should tell the people we are going to take this down. If the people say NO, then the pastor should resign, dust his feet off and move on. Yes this is the blinding ignorance preachers. Do they really read the bible or are they compromising with the parishioners. They would lose people calling them heretical. I have much about the Illuminati and where they got this. Egyptians. Washington DC is so paganistic if you research it. My people perish for lack of Wisdom. Lord have mercy on they’re souls. Also Easter is named after a pagan female goddess of the spring representing new birth. One of her symbols is the rabbit! Truly we should celebrate the resurrection every day! Amen. It is sad how easily the “Christian” world is deceived by Satan. Thank u for spreading the word. I’ve long since known what the steeples or Spears meant on churches. That’s why we don’t have them at any of our Kingdom Hall’s. Because it’s a symbol of horrible pagan worship. And it’s an abomination to Jehovah! It doesn’t matter what u don’t put on your kingdom Hall. It’s amazing to me that in this information age there are still complete idiots that fall for a cult like the JW’s even though their doctrines are widely known to be if Satan. Wondering what our Church Steeple article has to do with JW’s? At the end of the day that’s what matters.